1 Preheat oven to 190ºC/R5 with a baking tray inside. 2 Place breadcrumbs and black pepper in a shallow bowl and combine. Place flour on one shallow dish and the lightly beaten egg on another. Dip the cutlets firstly into flour, then egg followed by crumbs. Double crumb if you wish. 3 Heat oil in a large non-stick frying pan and brown cutlets until golden on both sides. 4 Place cutlets on the preheated tray and cook for 10 minutes until meat is tender and cooked through. 5 For the salsa, combine the spinach, pine nuts and fresh mint. Mix together the oil and mint jelly and spoon over the spinach mix, toss well together and allow to stand before serving. 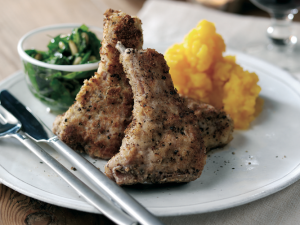 6 Serve cutlets with salsa and mashed squash or potato. And then for Sunday why not go for the easiest roast with veggies ever?